Public Access includes the full-featured catalog searches including Author, Title, Subject and Keyword searches. Switch between Catalogs with a single-button. Designed to work much like the traditional card catalog but uses the speed and power of the computer. Do a text search where a misspelling returns a closest match instead of the unfriendly "no matches" response. Searches are not confused by partial text entries, leading A, AN, THE, or numbers. These are all treated as ACCR2 would expect. Color and text cues distinguish various categories. Color Flag (¦) indicates a MEDIA item. Italics indicates an alternate title or author. Text colors distinguish SERIES TITLES and CROSS REFERENCES. 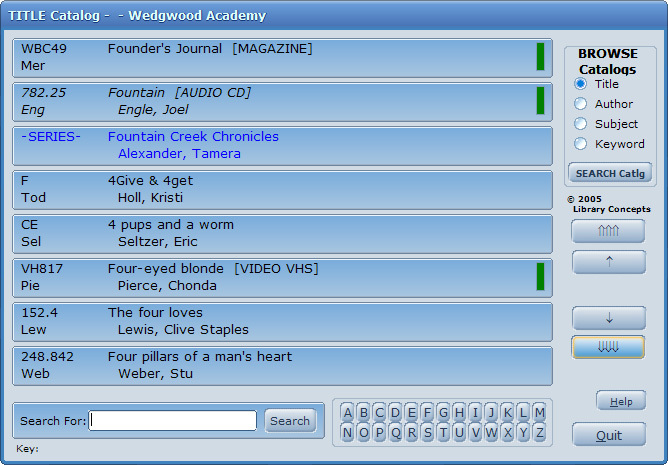 The Catalog activities in the PC Card Catalog DEMO emulate how the Public Access works. While Public Access is a stand-alone program, it is necessary for the library to have at least a copy of PC Card Catalog (BASIC or CIRCULATION) to maintain the book/media database. The librarian can define certain fields to either display or remain hidden. Public Access can start directly in the catalog. With appropriate settings in Windows, the computer can boot straight into Public Access. A password isolates the Windows desktop from the public user even trying a malicious restart. Catalog 'quick-search' letter keys can be sequenced for faster catalog lookup. Uses the handy and intuitive button/mouse wheel/keyboard scrolling forward and backward through the catalogs. Data changing features are inaccessible to the Public Access user. A librarian password keeps the the public user away from Preference settings and the ability to exit the program. Network capability is built-in and requires no additional licensing.